This video (above) was shot by the Webmaster himself using a Super 8 Movie Camera onboard HMAS DERWENT on her Far East Deployment in 1975, it is typical of Crossing the line ceremonies in HMA ships during this period. The Commanding Officer, CMDR Murray Ward, RAN is the person you see first getting tried and sentenced. 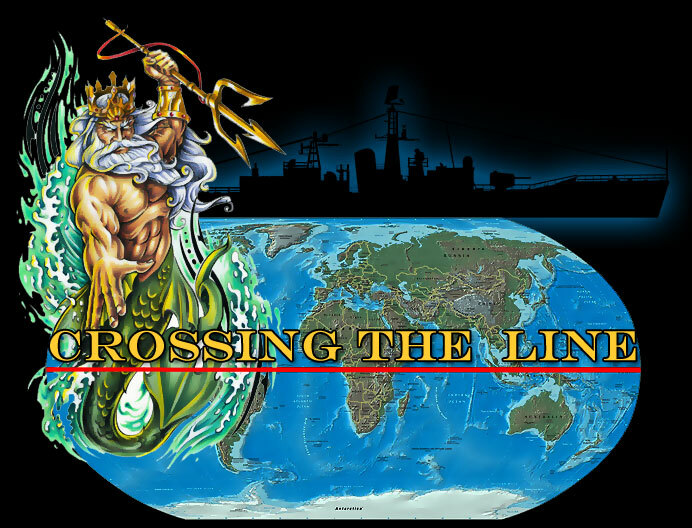 The origins of the present form of traditional ceremony of paying homage to King Neptune on occasions when warships cross the equator are obscure; but there appears to be little doubt that it originated from some form of pagan religious rites. The ceremony is today regarded as being essentially the affair of the ship’s company; being of course assisted and advised by the officers as necessary. It appears desirable that some basic principles should be recorded, and for this purpose relevant extracts from "the cruise of HMS New Zealand" on the occasion of the visit of a naval mission to India and the Dominions, headed by the late Admiral of the Fleet Viscount Jellicoe in 1919 are reproduced word for word, by kind permission of Admiral Sir Frederick Dreyer who was Lord Jellicoe’s Chief of Staff on that occasion. 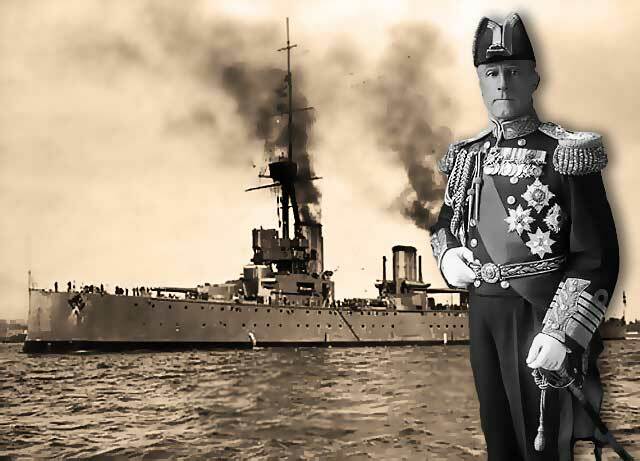 It is known that considerable attention was given to the revival of the ceremony by the officers and ship’s company of HMS New Zealand), and it is hoped that it may prove helpful to future generations "of those who occupy their business in great waters." The court was held on the port side of the midship deck, and a large well-filled bath and ducking stool were provided by the shipwright staff. Unfortunately, owing to the rolling of the ship, the water could not be retained in the bath to a sufficient depth to allow the stool to be used, as the commander found to his cost, striking the deck with his head on falling. Two courts were held, one at 9:00 a.m., Closing at noon, and one at 4p.m., And every novice was initiated, except lady Jellicoe, who was excused, although she made close acquaintance with the court and its rites. The admiral of the fleet, on seeing the certificates to be awarded to all those who were duly initiated, decided to earn one himself, although this was by no means the first time he had been welcomed in King Neptune’s southern realm. The following is an extract from the record of the great ceremony which was enacted in the court of His Majesty King Neptune on the eighth day of may, Anno Domini MCMXIX. On Tuesday, the sixth day of may, the outlying scouts sent information to the secretary of state that HMS New Zealand, had left Colombo au hour short of noon the previous day, having put into berc for 1,780 tons of coal, and was steering a south-easterly course towards the Cocos Islands. Thereupon the secretary of state, in the customary manner, issued instructions to the Bears to intercept the ship soon after sunset on the evening of Wednesday, to board her, and, in a courteous and nautical manner, to issue the proclamations and the summonses, and to bear back to him such communications as the ship might wish to make. The Bears bowed low in assent, grasped the proclamations, and passed from the watery apartment. The sun had sunk some time behind fine masses of cloud to be succeeded by a rarely beautiful sky, such as one sees only in the tropics, pale golds and mauves and greens and roses; and now there was only the soft blackness of the tropic night all around, except when the lightning lit the whole scene for half a second or played here and there or everywhere round the horizon. The ship swung sleepily to a long swell from the south-east, and a warm, humid temperature made the night oppressive. The Bears had approached close to the ship and were about to hail her when they noticed that all was not well. A Scout was sent on board, returned shortly and reported that the Medical Staff had succeeded that afternoon in mislaying the "Appendix" of a Mr. Farrell, Gunner, R.N., who was in such a state about it, that any noise might irritate him to a dangerous extent. The Bears, therefore, boarded the ship quietly. Their brown hairy coats exuded a strong smell of Stockholm tar as they made their way, declining all offers of assistance, towards the Admiral’s cabin. There they presented to the Admiral of the Fleet an illuminated letter from His Majesty King Neptune. How sweet the thought of meeting! A year where Neptune holds his sway. With Him We send you greeting! The best of friends, the best of news! If happier they’ll make you. And never then forsake you. Another letter, announcing their Majesties’ wishes, in regard to the procedure at the morrow’s court, was then handed to the Captain. The Equator, May 7th, 1919. Captain 0. E. Leggett, Of His Britannic Majesty’s Royal Navy. Tomorrow some time after nine. Is one who erstwhile steered the Fleet. First in the fight or social trip. And blessed by us upon her way. Shall be in right historic way. We’d counsel not to wear too much. Of nineteen hundred and nineteen. To this we wish a prompt reply. Farewell Yours, Neptune, R. and I.